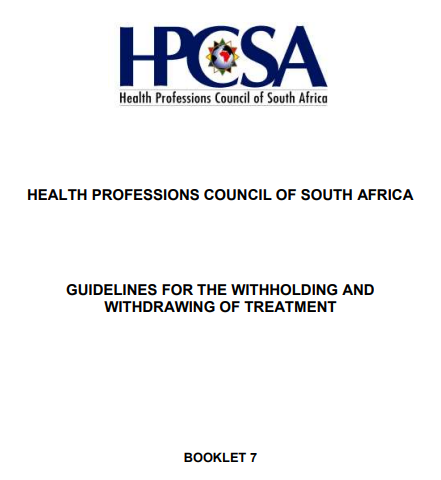 Whilst doctors are not obligated by law to honour your end-of-life wishes, their HPCSA guidelines encourage them to. They are more likely to do so if your wishes are reduced to writing and a medical proxy is appointed. 2.1 The National Health Act (Act No. 61 of 2003) allows patients in writing to mandate a person to act on their behalf when they are no longer able to do so. Therefore, patients should be encouraged to appoint in writing a person to make decisions on their behalf when they are no longer capable of doing so. The patient-selected proxy decisionmaker must then be regarded as the substitute for the patient whenever reference is made to the patient in these provisions. 2.2 Patients and their families, unless a contrary wish is expressed, must be kept informed of treatment, treatment alternatives and outcome probabilities. 2.3 Patients should be given the opportunity and be encouraged to indicate their wishes regarding further treatment and to place in writing their directives for future care in possible critical circumstances, (e.g. permanent coma or terminal illness). An appropriately drafted “living will” may be used for this purpose. These instructions can also be set out in the mandate to a third party mentioned in para 2.1 above. Patients should also be given the opportunity to reconsider their directives from time to time and to alter instructions, should they wish to do so. 2.4 When the patient is incapable of being involved in making a decision related to treatment and no advance directive or other information regarding the patient’s wishes is available, close family must be consulted and a decision taken in what is considered to be the patient’s best interests. 7.1.1 Where a patient is competent to participate in decision-making, healthcare practitioners must discuss with the patient their conclusions about diagnosis, prognosis and which options they consider may be in the patient’s best interests. It is for the patient to judge what might be acceptable; what weight or priority to give to any burden or risks; and to decide which of the options would be in his or her best interests. 7.1.2 Healthcare practitioners should bear in mind that the decisions of competent adult patients to refuse a particular medical intervention must be respected, even where this would result in serious harm to them or in their own death.